Our Hostel is a 8-minute walk from the beach. Set in a refurbished building featuring a terrace with panoramic views and a bar, Eco Hostal Offenbacher-Hof offers rooms with free WiFi and plasma TVs. Soberly decorated in soft colours, rooms at Hostal Offenbacher-Hof have large windows overlooking Viña del Mar, seating areas and minibars. The building was declared cultural heritage. 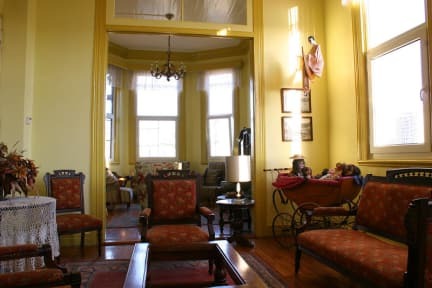 Guests can unwind in the charming terrace which boast scenic views of Viña del Mar and Valparaíso, or enjoy themselves reading a book in the lounge. We are located in one of the best Vina del Mar, near to some of the best landmarks and attractions of the area such as Castillo Brunet, Reloj de las Flores, Mirador Condell and the beach of Vina del Mar, amongst other interesting elements and places that you can discover and visit around our city. We have several private accommodation options available, all of them with several capacities and all the necessary services to ensure a great stay to our guests and travellers. A Continental breakfast including coffee, tea, milk, cacao, homemade jam, butter, ham, cheeses, yogurt, oats, fresh juices and natural fruits is served daily. Guests may park on the street, right next to the property. There is a space reserved for guests. It has a roof but is open and is available only on a first come, first serve basis. If the traveller present at the check in moment their Migration Card (Tarjeta Migratoria) the tax fee will be exonerated and valid passport.